This Thursday, we're teaming up with the folks at Zagat for a panel discussion that is, to put it bluntly, epic. Nancy Oakes (Boulevard), Gary Danko (Gary Danko) and Mourad Lahlou (Aziza) will be on hand, along with SF Chronicle food critic Michael Bauer, to discuss San Francisco's food story. We'll be asking them questions about the current state of the city's restaurant scene and they'll be dishing out tips for aspiring chefs or restaurant owners (and hopefully they'll share a few pointers for scoring a reservation at their top-rated restaurants). The Google+ Hangout will take place live starting at 6 PM EST. You can submit questions and get an invite to participate here. If you want to stream it live, tune in to our Google+ Page to see this impressive roster of food peeps share their thoughts. cloud-based Google Wallet app that supports all credit and debit cards. The new version of the app provides access to the same set of payment cards when you’re shopping in-store as you would online with Google Wallet. Already we’ve seen a significant increase in signups and app usage as people have loaded all their cards into Google Wallet. To make it even easier to save cards to Google Wallet, we’re working with credit and debit card issuers on a novel approach to adding cards to your wallet. 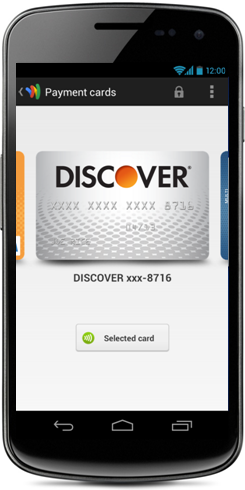 Discover Card is the first issuer to launch an implementation of our new Save to Wallet API for Payment Cards. And that’s it! You don’t even need to look up your credit card number, let alone type it in. 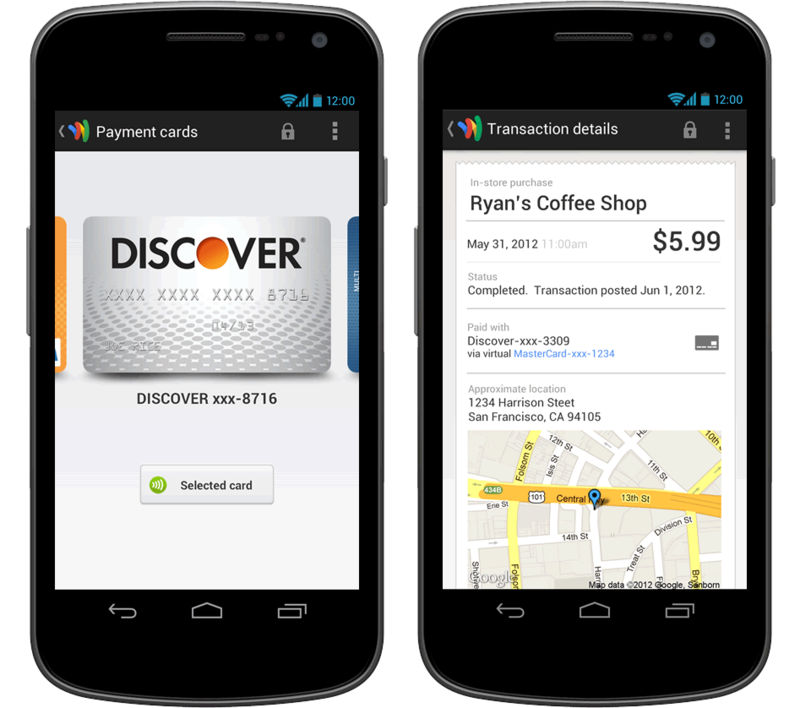 Discover securely transmits all required information directly to Google Wallet. You can then select your Discover Card to be the primary method the Google Wallet app will use for in-store purchases, or when shopping online from Google Play or other merchants that accept Google Wallet. You’ll continue to earn rewards on every purchase you make. 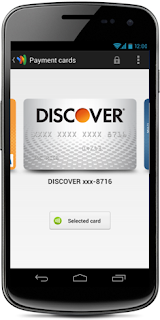 Discover has also provided Google Wallet with card imagery for the Discover More® Card, so you can easily identify your virtual Discover card in your mobile wallet. So go ahead and save your Discover Card into your Google Wallet today. And if you haven’t yet tried our new Google Wallet app, it’s available now on compatible phones in the US. 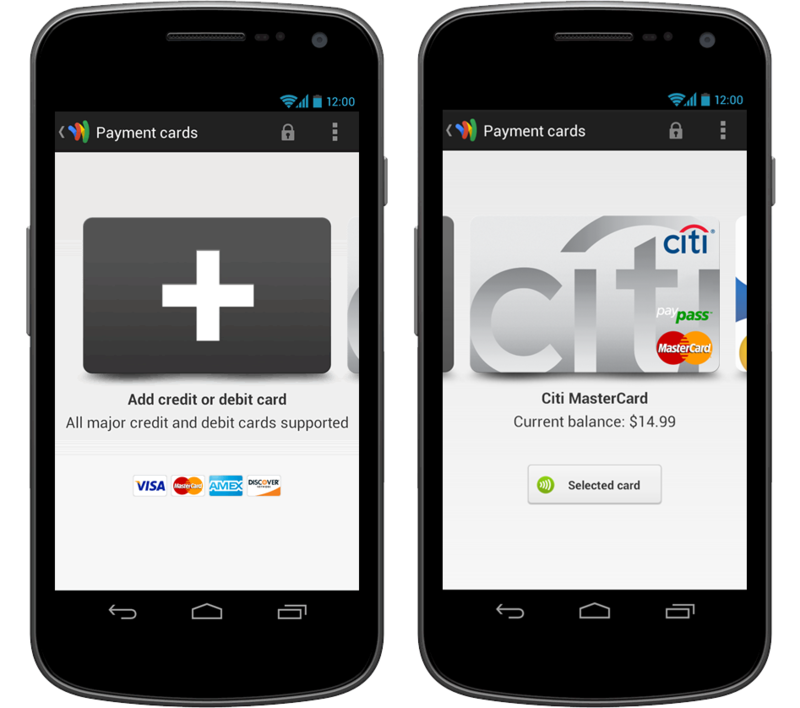 A few weeks ago we released a cloud-based Google Wallet app that supports all credit and debit cards. The new version of the app provides access to the same set of payment cards when you’re shopping in-store as you would online with Google Wallet. Already we’ve seen a significant increase in signups and app usage as people have loaded all their cards into Google Wallet. Google Offers has swag for every type of student. Parents of K-8 kiddos, make your little one feel special with a personalized lunch box—then stock it up with earth-friendly, reusable sandwich bags. Jumpstart her love of science by surprising her with a subscription to the Magic Schoolbus Science Club, or pique her imagination with a glossy, art and poetry-filled Cricket or FamilyFun Magazine. You can even help your child hone his long division skills with an online math prep course—but save plenty of time for your tot to color outside the lines with a crafty Doodle Roll art kit. Hitting campus for the first time? Get ready for dorm life with some upcoming Google Offers (starting 8/15), including school essentials, like funky Mimoco flash drives or a self-filtering Hydros water bottle. Go ahead, wow your professors with your speed-reading and language skills (check out offers from Iris Reading and Livemocha)—just don’t neglect your wardrobe. Online boutique Betabrand specializes in wearable whimsy, with hoodies, dresses, reversible smoking jackets, and even disco pants, as well as back to school-worthy backpacks. Recent college grads, gear up for your first “grown-up” job by taking your spreadsheet skills to the next level with an online course from Udemy. It’s also time to start saving, so plan for your (financial) future with LearnVest’s online academy. Back to school supplies have come a long way from pencils and 3-ring binders—and let’s face it: they’re a whole lot more fun to drop in your virtual shopping cart. So get moving. Shopping is now in session. Check your inbox for more Back to School bargains from Google Offers. The school year’s just around corner, and that means one thing: you’ve got an A+ excuse to put your shopping hat on. From pre-kindergartener to PhD, Google Offers has swag for every type of student. we announced a series of Hangouts on Air designed to help guide small and medium sized businesses through the transition to Google Shopping. We appreciate how many of you took the time to join the hangouts and wanted to make the sessions available for those who were not able to attend live. Our first Hangout on Air provides an introduction to Google Shopping, including an in depth overview of the changes. Watch it here. Session two provides an introduction to Merchant Center and walks through best practices for getting started. Watch it here. The third hangout in our series guides you through the creation of Product Listing Ads and covers best practices for optimizing your performance. Watch it here. Our final Hangout on Air covers Google Trusted Stores and walks through how your business can participate. Watch it here. We hope you find these sessions useful as you transition to Google Shopping. You can find these videos and all future Google Shopping videos hosted on our YouTube playlist. Last month we announced a series of Hangouts on Air designed to help guide small and medium sized businesses through the transition to Google Shopping. We appreciate how many of you took the time to join the hangouts and wanted to make the sessions available for those who were not able to attend live. We take security very seriously and have always had a dedicated Google Wallet PIN to prevent others from making payments with your Google Wallet. And as always, we encourage Google Wallet customers to set up the phone’s screen lock -- as an extra layer of protection. Quick tip: lot of questions about the need for Internet connectivity while using the Wallet app. You will need an Internet connection to enter a credit card; to change the selected payment card; and to see transaction details. However, you will not need an Internet connection to actually make a payment in-store if you have previously selected a card.